For those who are on the hunt for a brewer that offers both affordability and advanced control, search no more. A product of Behmor, the Brazen Plus boasts of a design and technology that exceeds any other coffee maker in its class. 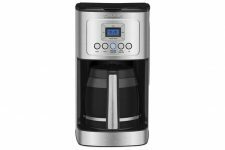 With the ability to be programmed in a variety of ways, the machine allows users to modify water temperature, altitude calibration, and pre-soak settings to create the perfect cup of joe. 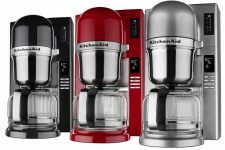 This is the ideal system for selective coffee lovers and critics who are looking for an appliance that won’t break the bank. 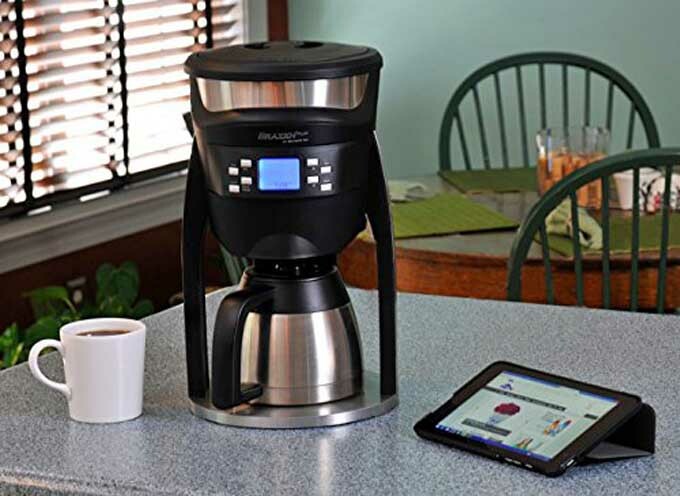 While many coffee-making devices use a fixed method of heating with a wide variance range, the Brazen provides users with the ability to set exceptionally specific brew temperatures. The adjustable settings allow users to choose any degree between 190-210 F, with only a 0.5 ° fluctuation. 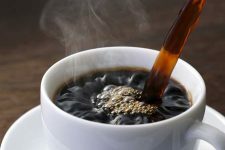 Because different aspects and flavors of coffee tend to emerge depending on the level of heat that it is brewed at, being able to control the water temperature is essential to creating the ultimate profile. 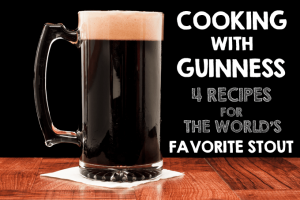 In addition to modifiable temperatures, this brewer is also capable of being calibrated to various altitudes. 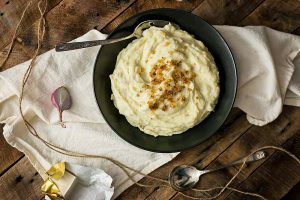 Because water boils at different rates, depending on the elevation, Behmor has developed a feature that compensates for the differentiation that this causes in flavor. It is crucial to set the proper altitude on the machine, in order for it to function properly and efficiently. The pre-soak element provides users with the option to steep the grounds for an allotted time (between 15 seconds and four minutes) prior to brewing. This allows for an even saturation and distribution of the coffee. The function can be particularly beneficial for fresher beans, which are more prone to higher levels of “blooming,” or degassing. Many users have pointed out the brewer’s rather comic resemblance to a futuristic spacecraft; however, its design was carefully implemented by the manufacturer to offer extensive ergonomic efficiency. 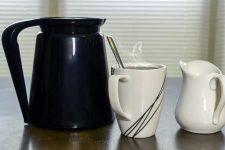 Along with its user-friendly structure, the stainless steel used for both the double-walled thermal carafe and reservoir offers a combination of benefits, including: quality taste assurance, equipment durability, and excellent heat retention, which eliminates the need for a hot plate (and scorched java juice). The shower-type saturation feature is another perk that this device offers. Instead of pouring water directly into the center of the grounds (a tactic that many of its competitors employ), the Brazen applies an evenly distributed flow over the filter. This approach helps the system to evade the common error of over-saturating one specific area. 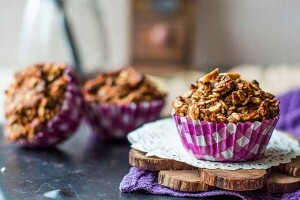 Other features of the Behmor Brazen include pre-programmable auto start times and memory storage. You can remove the carafe and place any pour over device directly under the water outlet. That means you can use your V60, Kalita Wave, Chemex Brewer, etc. 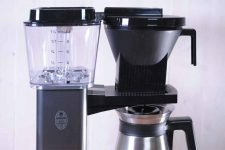 Which makes this an extremely versatile and convenient machine for those who use pour over devices. 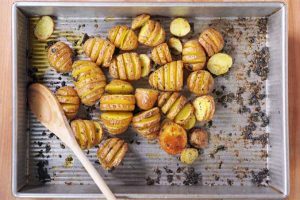 No more huddling over the stove top with a pan of water and thermometer in an effort to get the perfect temperature for your particular coffee bean variety, roast level and grind size. Various user comments on Amazon attest to this very useful feature. To get the best out of this machine, I highly recommend a quality home coffee grinder such as the Baratza Virtuoso or the Baratza Vario. 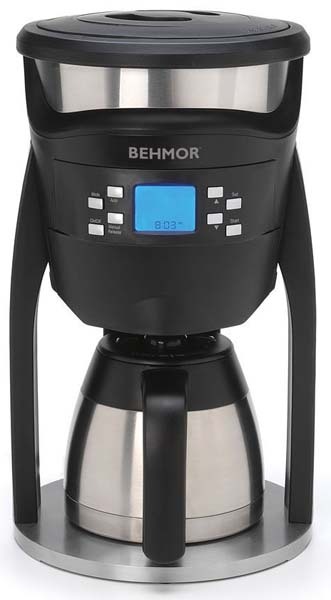 Behmor’s Brazen Brewer is a high-quality and easy-to-use machine that provides users with unmatched control over the brewing process at a decent price. You would most certainly have to spend more to find another coffeemaker with the same capabilities. Adjustable Temperature Range Management: Specify your chosen brew temperatures ranging from 190°F to 210°F. Power Regulated Heat Range: Program configurations guarantee specific water temperatures are attained and never lower or higher. Reservoir & Boiler: The stainless steel water tank and boiler are one piece, which allows for a far more steady brew temperature. Elevation Correction: Easily adjustable for altitude differences and changes in the boiling point. 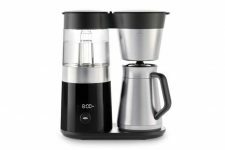 Double Walled Insulated Stainless Carafe: No hot plate to scorch your coffee, the carafe preserves the heat and the taste for several hours. Auto-Timer: Although we don’t recommend this for the best cup (read why fresh ground is better), a program auto-on time function is available that will start up your coffee brewing whenever you want. Total Saturation Water Distribution Sprayhead: Equal water dispersal over your coffee grounds increases the taste in your mug. Pre-soak Functionality: Create a proper bloom by pre-soaking your grounds from 15 seconds to 4 minutes. Extra-large Gold Grounds Basket: Allows your grounds space to bloom without spillage. 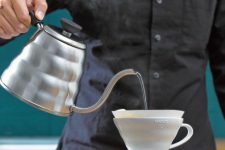 Brew Directly Into Your Servicing Vessel: Establish a precise water temperature, take out the carafe, and utilize your Brazen as a kettle for your preferred pour-over or to make tea. Well, there really aren’t any cons unless you consider Chinese manufacturing to be an issue – some folks do and some folks don’t and lets face it – this would be a much more expensive unit if it were manufactured in the US, Canada, or Western Europe. Either way I digress. This plus version as fixed any lingering issues that were a problem with the 1st and 2nd generation non-plus models. 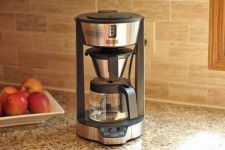 Behmor has made continuous improvements to the Brazen Coffee Brewer since it was released and has provided awesome customer support for any and all issues. I’m including these old issues in case you read reviews of older models. THESE NO LONGER APPLY. Clogged Screens: 1st generation models were not without their snags. On the original models, a screen was in place that was designed to catch large pieces of debris prior to entering the pump mechanism. However, the screen would often become calcified and clog with hard water usage. This problematic filter was removed on the 2nd generation models. 1st Gen Leaking Carafes: A few of the 1st generation carafes were prone to leak around the mouth. 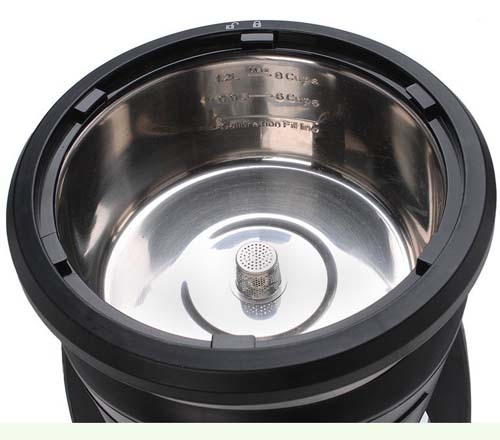 Behmor redesigned the carafe to eliminate this problem and at provide replacements to those select number of customers that were affected. Folks, you don’t find that commitment to customer service by the larger manufacturers. Read more user pros and cons and reviews on Amazon. 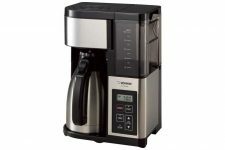 The only other coffeemaker with comparable features is the much higher priced Technivorm Moccamaster. 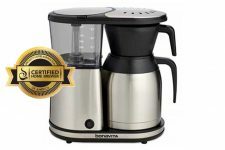 Although the Behmor is about half the price of the Moccamaster, the Technivorm product line is made with better materials and fit and finish. 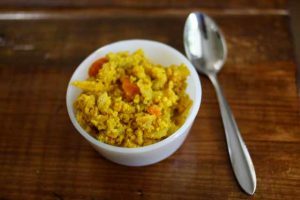 One of the most strongly emphasized instructions is to use only filtered water. 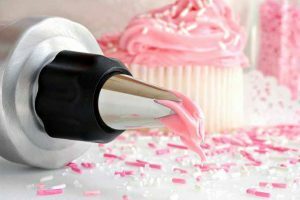 The manufacturer stresses that the liquid’s quality is highly important, as it affects both the taste of the beverage as well as impacts the functionality of the machine. 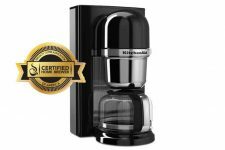 This is one of the best automatic coffee makers on the planet and is really unmatched except for more expensive products such as the previously mentioned Technivorm Moccamaster. The Technivorm offering has better construction in the form of mostly metal pieces including a copper boiler, but it is more expensive though it doesn’t brew any better. And the Brazen Plus’s construction is way more than adequate. It’s definitely 3 or 4 steps above a Mr. Coffee. Would I buy this? Heck yeah! I own and use two of them – one in the kitchen and one in the garage/man-cave. Need more choices? 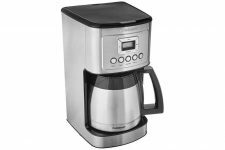 Be sure to check out all of our coffee maker reviews now as well as our in-depth drip coffee maker buying guide. I NEED THIS IN MY LIFE. I am a sucker for a good pour-over (it’s the only black coffee I can drink) but find the process a little too tedious, and buying from cafes and coffee shops can get a bit too expensive. Now to see if the Philippines is going to get in on this action and make the product available here. This is going to be perfect for all the all-nighters I’m anticipating because of uni.